Toujours — an update of our Forever theme — has a simple, elegant design that’s perfect for planning and sharing moments from your wedding. The theme highlights your content with a slideshow, large featured images, and a unique layout for recent posts. It also includes a special Guestbook template to collect comments from your well-wishers. Toujours takes shape as you publish posts with featured images, and choose which posts to feature in the slideshow. Our demo displays the latest posts on the homepage, with a Featured Content slideshow and a special section just below it for your three latest posts. Add a featured image to each post you’re featuring. Choose images that are at least 1160 pixels wide and 655 pixels tall. To display three posts below the slideshow, navigate to Theme Options in the Customizer. Choose whether to display your three most recent posts in a special area above your other posts. This option works well with posts that have featured images. When using the Guestbook template on a page, it’s good to double-check that comments are enabled. To do this, edit the page and click on More Options. Under the Discussion header, check Allow Comments and publish. Toujours supports a number of different Post Formats, using unique styles to help them stand out. By default, Toujours shows a white decorative border inset on the featured images. You can turn off this border by going to Customize → Theme Options and unchecking the checkbox labelled “Display a thin inset border on featured images”. Toujours has space for widgets in the theme’s sidebar and footer. Widgets can be added by navigating to Customize → Widgets. 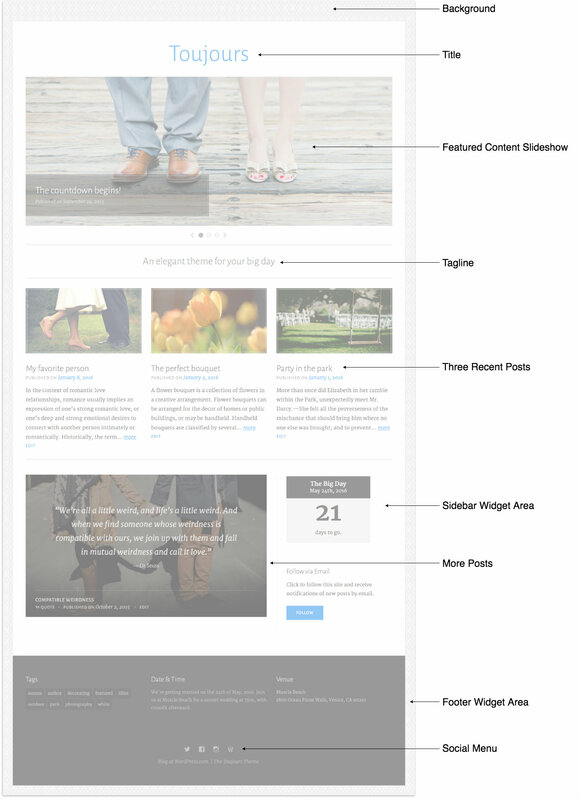 If no widgets have been added to the sidebar, the theme will display your content in one centered column. When one, two, or three widgets are added to the footer area, they will be displayed in one, two, or three columns, respectively. If four or more widgets are added, they will be displayed in four columns. Toujours requires a Custom Menu to be added before a menu will appear at the top of the page. To add a menu, go to Customize → Menus. Click the “Add a Menu” button and enter a name, like “Main Menu.” On your new menu, add the pages and post categories you’d like, then check the “Primary Menu” and save your changes. Toujours also features a Social Menu option. The main column is 760 wide. The sidebar is 335 wide. Widgets in the Footer Widget Area range from 267 wide (when there are four or more widgets) to 1160 wide (when there is one widget). The Custom Header image should be at least 1160 wide. Featured Images should be at least 1160 wide. If you’re using the Featured Content slideshow or displaying the three recent posts, they should be at least 655 tall. The Site Logo will display up to 600 wide and 200 tall .